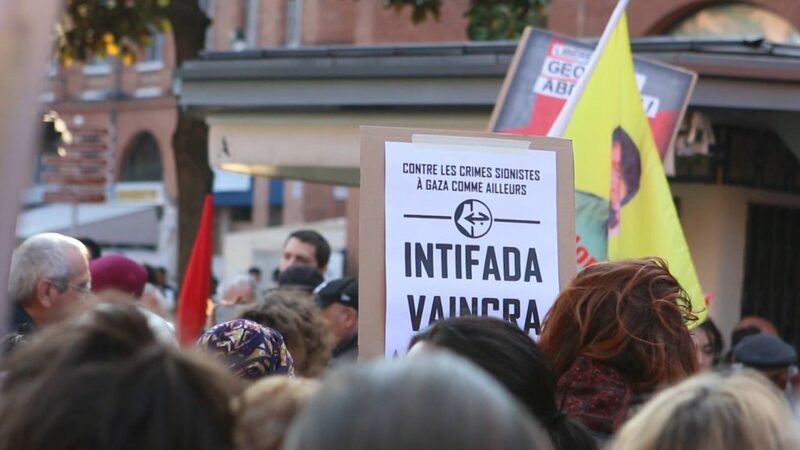 On 17 May, over 400 people took to the streets in Toulouse, France to stand with Palestine, in response to the Israeli massacre in Gaza on 14 May. Participants read out the names of the 113 Palestinians murdered by the Israeli occupation army since the beginning of the attacks on the Great March of Return in Gaza on 30 March. Organizations gave speeches as participants read out poems and held out candles to remember the Palestinian lives taken by the occupation. Protesters carried signs demanding freedom for Ahed Tamimi, Salah Hamouri and all Palestinian political prisoners, including Georges Abdallah, the Lebanese Communist struggler for Palestine imprisoned in France for 33 years. Coup Pour Coup 31 signs bearing the slogans, “Intifada Vaincra!” (Victory to the Intifada) and “Al-Quds, Capital of Palestine! Palestine from the River to the Sea!” were also widely carried. 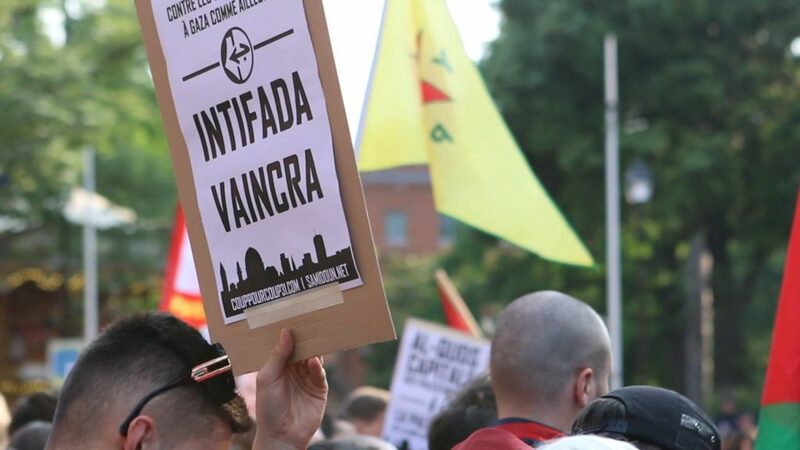 A number of Palestinian and solidarity organizations participated in the protest, as did a delegation from the Maison Franco-Kurde Midi-Pyrénées, who affirmed their support as Kurdish organizers for the Palestinian resistance and denounced the Israeli crimes. 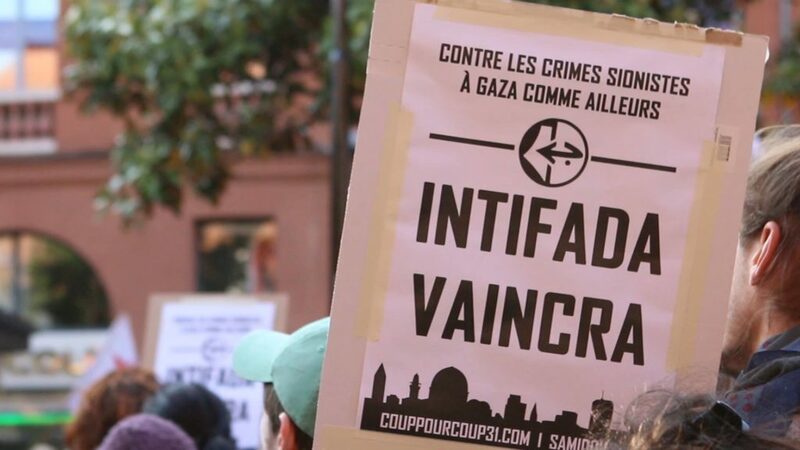 The next protest in Toulouse will take place on Wednesday, 23 May, where participants will gather at Place Esquirol to protest the attendance of Israeli ambassador Aliza Ben-Noun at a celebration hosted by the Toulouse Chamber of Commerce. 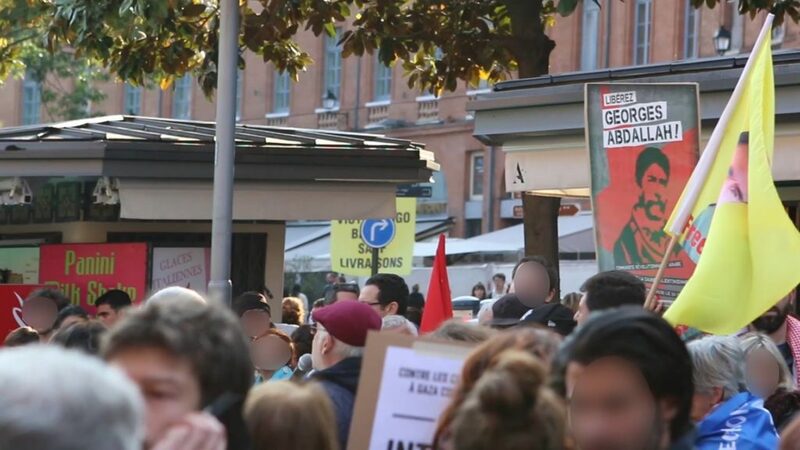 The protest is demanding Ben-Noun leave Toulouse and the end of French diplomatic relations with the Israeli state. I am speaking on behalf of the anti-imperialist collective Coup Pour Coup 31. 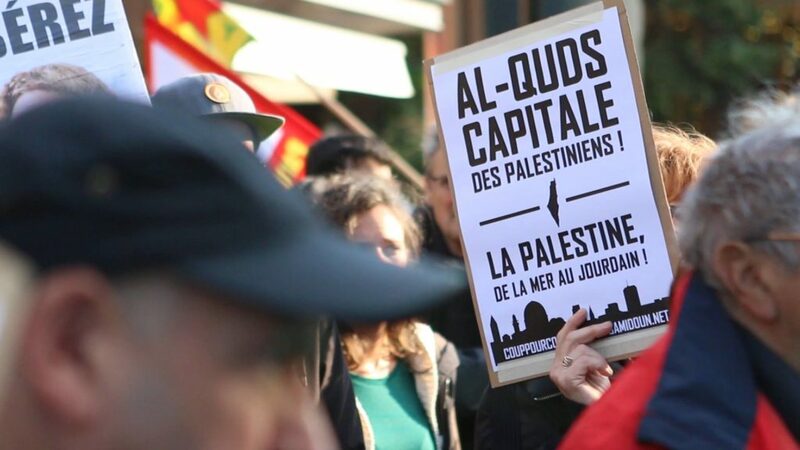 Once again, we are gathered here in Toulouse to support the Palestinian people against the colonization of their homeland, Palestine. Once again, we mourn the dozens killed in Gaza and the thousands of wounded men and women who were coldly shot down by the Zionist occupation as they marched with courage and determination to demand the end of the blockade of Gaza and their right to return, as part of the Great March for Return, which for several weeks has brought tens of thousands of people to protest in Gaza. We in Coup For Coup 31 lost two friends, two comrades in these massacres: Ahmad al-Adaini and Ahmed Abu Hussein, both members of the PFLP. Once again we denounce the imperialists’ support for the ethnic cleansing of an entire people – as we see today in Trump’s provocation to declare Jerusalem/Al-Quds the capital of the Zionist state. Once again, we shout our anger at the French government, which supports the Israeli state in its racist and colonialist policies. Macron continues to lock up a Palestinian resistance fighter, an Arab communist, Georges Abdallah. 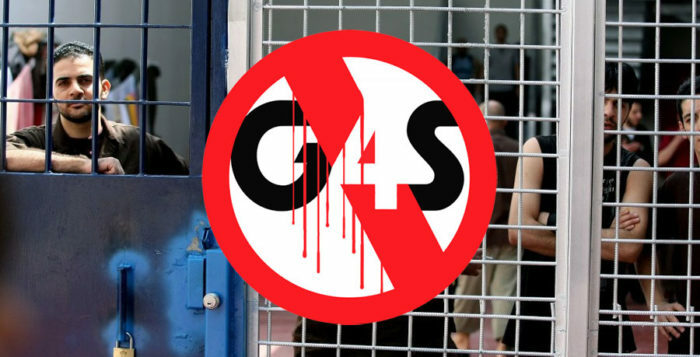 The same government keeps silent about the imprisonment of the French-Palestinian lawyer Salah Hamouri and criminalizes the boycott of Israel. And yet, the Palestinian people are still standing and resisting colonization more than ever before. 70 years after the Nakba, it is clear that no normalization is possible with the Zionist state, no peace is possible. What we support is victory! The victory of Palestine, free of racism and colonialism, throughout all of Palestine: from the river to the sea! And the Arab masses revolt and protest despite their corrupt governments in the pay of the imperialists and Israel. In Jordan, Lebanon, Algeria, Morocco, Tunisia, they are all shouting for a free Palestine! And the Kurdish PKK and their allies have denounced this new massacre in Gaza, presenting the way to a new alliance in the region against imperialism and its allies. 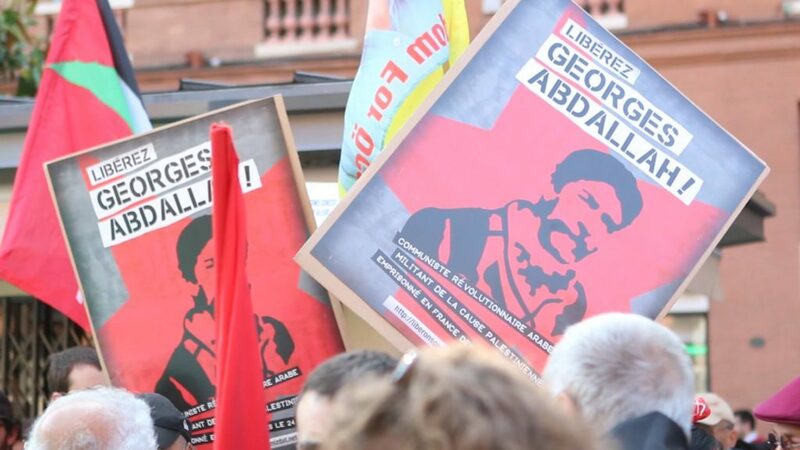 And still, Georges Abdallah, imprisoned in French jails for 34 years, is still standing strong, continuing to stand alongside his Palestinian brothers and sisters. 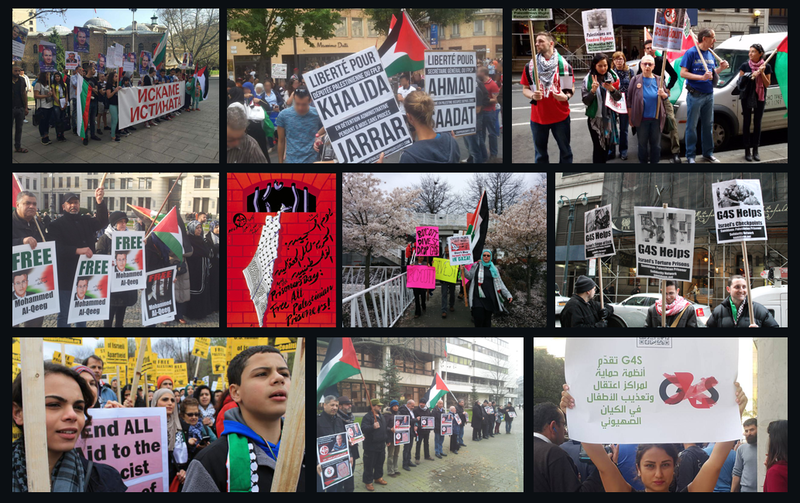 And in the imperialist countries, thousands of people show their support for the freedom of the Palestinian people and their support for the boycott of Israel. So, let us not resign ourselves! Join the anti-imperialist resistance, join the anti-Zionist resistance, join Coup Pour Coup 31 and the united initiatives for Palestine!